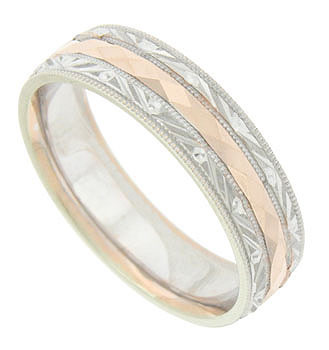 A faceted jewel cut red gold band is the central focus of this 14K bi-color mens wedding band. The outer edges of the ring are crafted of red gold, sharply angled and decorated with abstract organic engraving. Distinctive milgrain completes the edges. The antique style wedding ring measures 5.99 mm in width. Size 10 1/4. We cannot re-size, but we can reorder in other sizes. 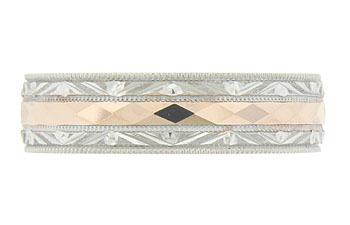 Also available in 18K, yellow gold, platinum and palladium. Contact us for current market cost.